Powers: Seraph has an unspecified degree of superhuman strength and control and manipulation of the elements. He’s displayed control of Earth to cause earthquakes and mould it into different shapes, wind to move objects and forceful enough to break bones and Fire. He can see supernatural creatures even if they are shrouded. 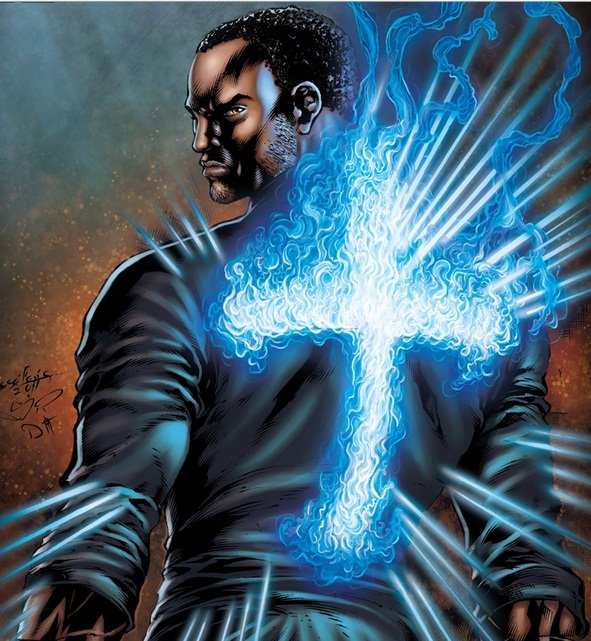 While his power is active the large cross tattoo on his back either glows or burns with blue flame. His power is also far more potent and controlled if he maintains an unwavering belief in god, if his belief falters his powers will diminish or become uncontrollable. His past is currently shrouded in mystery. He lived with his sister a few years ago who became a drug addict after he was never home with her and she felt abandoned. His sister found her way to the demon Nukpana who eventually lead to her death. Sometime after he committed suicide in an alley and was brought back to life. He somehow got a huge tattoo of the cross on his back and his powers developed. He’s been helping the helpless since then as he atones for his dark past. ← NY Cosplayer Network, Inc.